Evenly sprinkle both sides of the eggplant with 2 tsp. salt; let stand 20 min. Wipe excess salt from eggplant and dry slices with a paper towel. Completely but lightly coat eggplant with oil. Season to taste with pepper. Grill directly over medium heat, covered, turning several times until browned and tender when pierced with a fork (6-10 min.). Meanwhile, arrange tomatoes in a single layer on a baking sheet; season with salt and pepper to taste. Top tomatoes evenly with cheese; drizzle very lightly with oil. Place under a preheated broiler until cheese browns and is melted and bubbly (about 2 min.). Drizzle serving plates with oil and balsamic glaze. Arrange 4 large eggplant slices on plates; top each with red tomato rounds. Add another layer of large eggplant, then yellow tomato; repeat with smallest eggplant slices and smallest tomatoes. Drizzle towers with oil and balsamic glaze; garnish with basil, salt and pepper. Serve immediately. When assembling towers, use the largest slices on the bottom and use smaller slices as you stack up to prevent them from falling over. Multicolored heirloom tomatoes are recommended for their visual appeal. You can substitute any color tomatoes. You can substitute our recipe for Balsamic Syrup for the balsamic reduction. Melt butter in saucepan, add flour and cook about 1 minute, stirring. In another saucepan, heat milk to scalding. Gradually add the milk to the butter and flour mixture, bring to boil whisking constantly. Add cayenne pepper, nutmeg, and dry mustard. Simmer about 5 minutes. Stir in shredded white cheddar cheese, until melted and smooth. Cover with plastic wrap to prevent skin from forming, let cool. Can be stored in zip lock bags and store in freezer, to be used for later use, or use immediately, spread on tart or pizza crust. Mix 1 1/2 cups all-purpose flour, 1-cup rye flour, 1-cup wheat flour, and salt together in a bowl. Pour 1/2 cup water into a microwave-safe bowl; heat in microwave for 30 seconds. Stir brown sugar into water until dissolved; add yeast and stir. Let mixture stand until bubbling, about 10 minutes. Pour yeast mixture into flour mixture. Pour remaining 1 cup water into a microwave-safe bowl, add caraway seeds, and heat in microwave for 30 seconds. 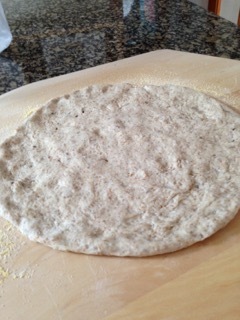 Stir olive oil into the warm water; pour over flour mixture. Knead flour mixture, adding more all-purpose flour if dough is sticky, until dough is smooth and holds together. Form dough into a ball and place in a bowl. Cover bowl with a damp towel and let rise until doubled in size, about 1 hour. Punch dough down and transfer to a floured work surface. Roll or shape dough into desired shape. Bring stockpot of lightly salted water to boil. Place greens in pot, cover, and cook for 5-7 minutes. Drain and set aside. In sauté pan, on medium high heat add olive oil and onions. Sauté for 3-5 minutes. Add greens, kidney beans, tomato sauce and spices. Stir and heat until greens mixture is heated through. I you like, just before serving dash with Sriracha Sauce. Serve hot. *May blend with other greens such as turnip, kale or collard to equal 16 ounces. In a medium skillet, cook the butter over moderate heat, stirring, until golden brown and nutty smelling, about 5 minutes. Crack the eggs into the pan and cook until the whites are just set and the yolks are runny, about 3 minutes. Season with salt and pepper. Slide the eggs on top of the Curried Kale and Beans, breaking up the eggs to distribute them evenly. Serve hot. Bake at 300 degrees F for 1 ½ to 2 hours depending upon the size of your pan. The cake should feel firm to the touch at the center and a wooden toothpick inserted into the center should come out clean. The cake should be cooled completely in the pan on a wire rack before removing. If you have decorated the top with fruit and nuts, brush with a simple glaze of equal parts water and sugar boiled together for about 10-15 minutes. You can also brush the cake with brandy or rum.